Luke Skywalker’s bionic hand. Credit: Georgia Tech. Luke Skywalker’s bionic hand is a step closer to reality for amputees in this galaxy. Researchers at the Georgia Institute of Technology have created an ultrasonic sensor that allows amputees to control each of their prosthetic fingers individually. It provides fine motor hand gestures that aren’t possible with current commercially available devices. 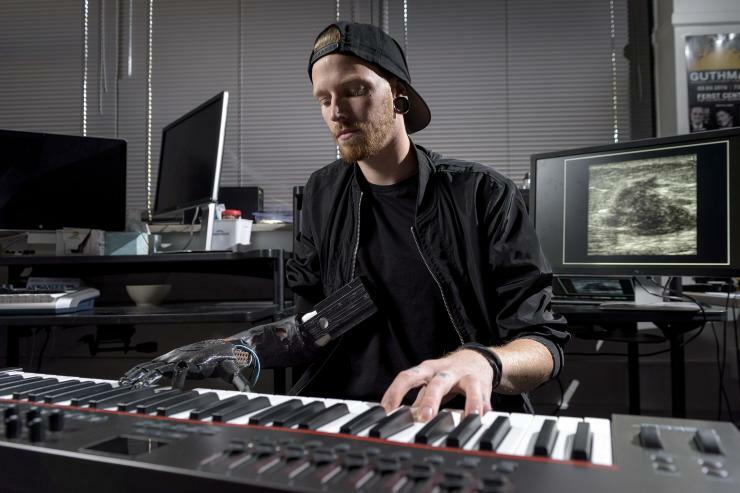 The first amputee to use it, a musician who lost part of his right arm five years ago, is now able to play the piano for the first time since his accident. Jason Barnes is the amputee working with Weinberg. The 28-year-old was electrocuted during a work accident in 2012, forcing doctors to amputate his right arm just below the elbow. Barnes no longer has his hand and most of his forearm but does have the muscles in his residual limb that control his fingers. Barnes’ everyday prosthesis is similar to the majority of devices on the market. It’s controlled by electromyogram (EMG) sensors attached to his muscles. He switches the arm into various modes by pressing buttons on the arm. Each mode has two programmed moves, which are controlled by him either flexing or contracting his forearm muscles. For example, flexing allows his index finger and thumb to clamp together; contracting closes his fist. But then the team looked around the lab and saw an ultrasound machine. They partnered with two other Georgia Tech professors – Minoru Shinohara, Chris Fink (College of Sciences) and Levent Degertekin (Woodruff School of Mechanical Engineering) — and attached an ultrasound probe to the arm. The same kind of probe doctors use to see babies in the womb could watch how Barnes’ muscles moved. “That’s when we had a eureka moment,” said Weinberg. When Barnes tries to move his amputated ring finger, the muscle movements differ from those seen when he tries to move any other digit. The team fed unique movement into an algorithm that can determine which finger Barnes wants to move. This is the second device Weinberg’s lab has built for Barnes. He loves drums, so the team fitted him with a prosthetic arm with two drumsticks in 2014. He controlled one of the sticks. The other moved on its own by listening to the music in the room and improvising. The device gave him the chance to drum again. The robotic stick could play faster than any drummer in the world. Worldwide attention has sent Barnes and Weinberg’s robots around the globe for concerts across four continents. They’ve also played at the Kennedy Center in Washington, D.C. and Moogfest.